Sensory Computer Systems Forums :: View topic - Q: How can I display many small Images to Panelist? Q: How can I display many small Images to Panelist? Posted: Wed Dec 21, 2005 1:02 pm Post subject: Q: How can I display many small Images to Panelist? I have about 21 small images which I'd like to show to our panelists on one questionnaire panel, then ask a couple of questions about them. What the best/easiest way to accomplish this? Here is a good example that I did recently using a bunch of color swatch images. In my example I'm showing the panelist 21 images! With room to spare. See print screen #1 below. 1. I reviewed our image requirement for our Sensory Test. 2. Instead of trying to add all 21 images to SIMS 2000, I decided that its really much easier to display the entire set of 21 as ONE Image in SIMS 2000. 3. I placed all of my 21 image filess in temporary Windows sub folder. 4. Used a thumbnail Image view tool, such as Microsoft Office Picture Manager, see Print Screen #2. 6. Use 'Print Screen' Keyboard key to COPY Screen to Clipboard. FYI: Good news, it took me longer to write this email message then to get the 21 images (as one) into a SIMS 2000 questionnaire as shown below. It's easier than it looks. All about image preparation. 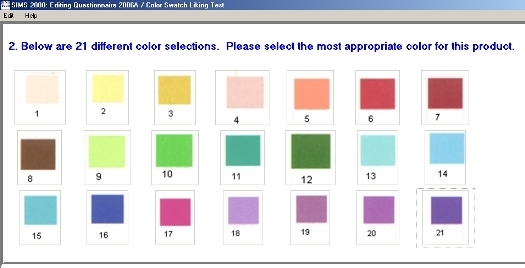 Print Screen #1, the final questionnaire panel in SIMS 2000. 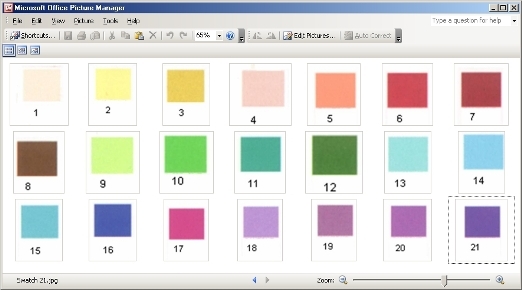 Print Screen #2, All images displayed in Microsoft Office Picture Manager.